I had quite a few avocados that I purchased on sale so I thought I better try and use some of them up. I was not in the mood for a super fancy breakfast/lunch kind of meal so I made this simple dish that did not take up a lot of my time as I had a lot of appointments. I like Garbanzo beans but I did not want to make a smooth hummus so I mashed the garbanzo beans really chunky, same as the avocados. I was impressed with the simplicity of my meal it came out really good. Filled me up, hit the spot and I was on the go so it was perfect! Enjoy! Mash the garbanzo beans in a bowl until you get a chunky texture. Add the tahini sauce and mix well. Season the garbanzo mixture with salt and pepper. Set aside. Cut up the tomato into chunk bite size pieces. Half the avocado and remove the seed. Scoop out the fleshy part of the avocado and put in a bowl. Add the Roma tomato, lime juice and cilantro in the avocado and mix well. You want a chunky smooth kind of appearance. Season the mixture with salt and pepper. 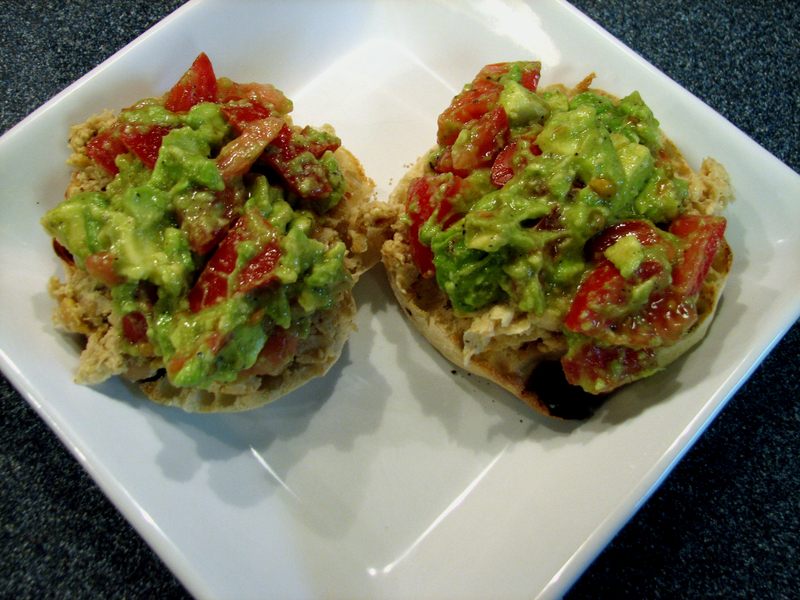 On the toasted English muffin, smear about ¼ cup of the garbanzo mixture on both sides of the English muffin and spread on top with the Avocado/Tomato mixture. I do not know about you, but when I hear the word salad, I think greens, tomatoes, cucumbers, and all the other fresh vegetables that go in a bowl, tossed and drenched in dressing. Today is an overcast, icky day in Columbus Ohio so…… I thought what a better way to cheer up myself on this blah day and make a salad that has bright colors in it. If Mother Nature will not bring me sun today, at least I can create it in my kitchen. I did not have any green lettuce or spinach but I made this salad instead and I am just excited – a different kind of salad. 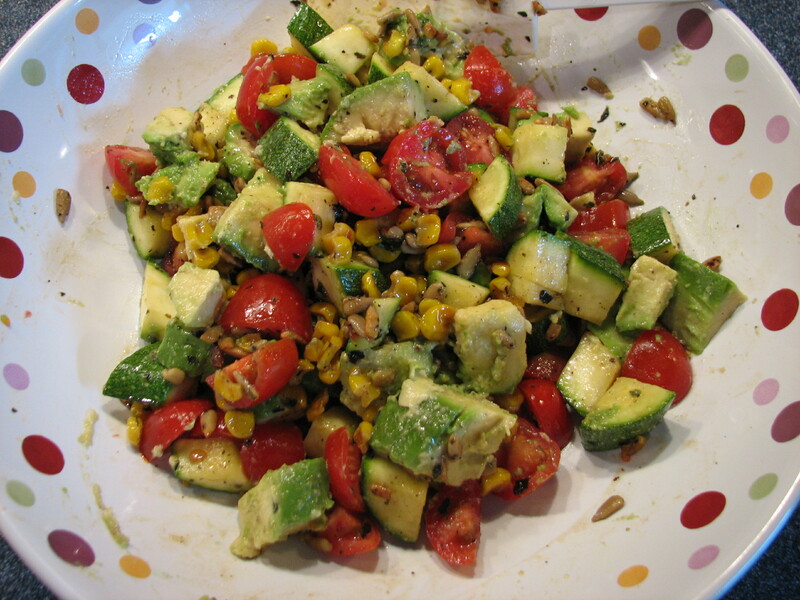 I toasted sunflower seeds and sweet organic corn off the cob, topped with fresh cherry tomatoes, avocados, lightly sautéed zucchini salad with a tad of olive oil. I’m a happy person right now. 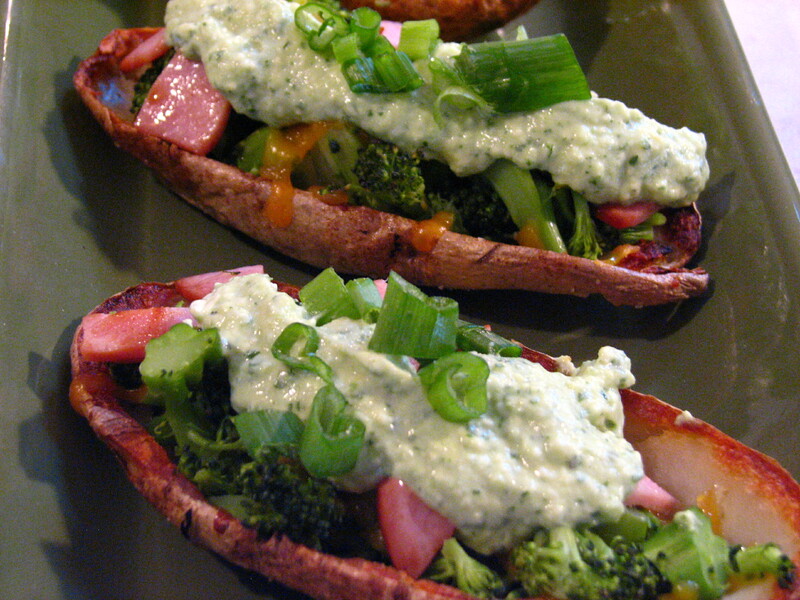 I am looking forward to trying this again over the summer with fresh farmer market vegetables. Enjoy! 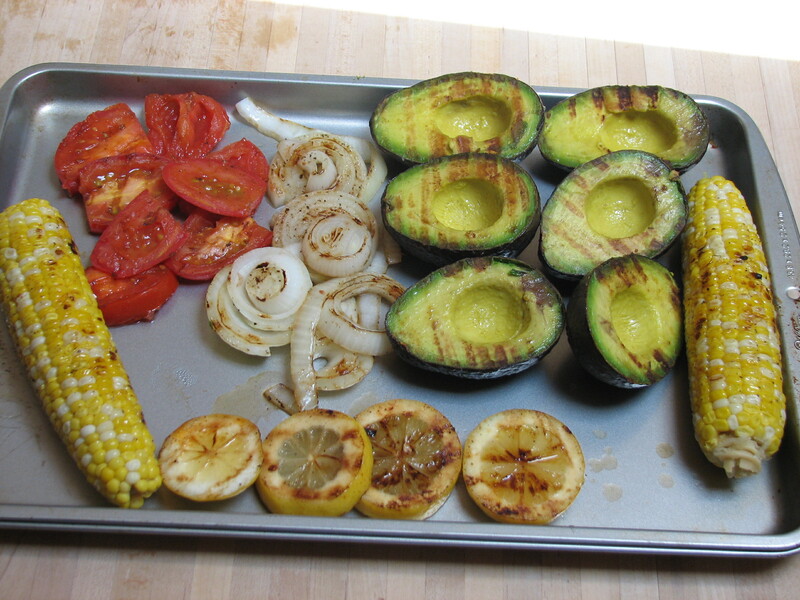 In a small sauté pan, heat up over medium heat 1 tablespoon of oil of your choice and add the corn and sunflower seeds, season the corn and seeds with salt and pepper along with the basil. 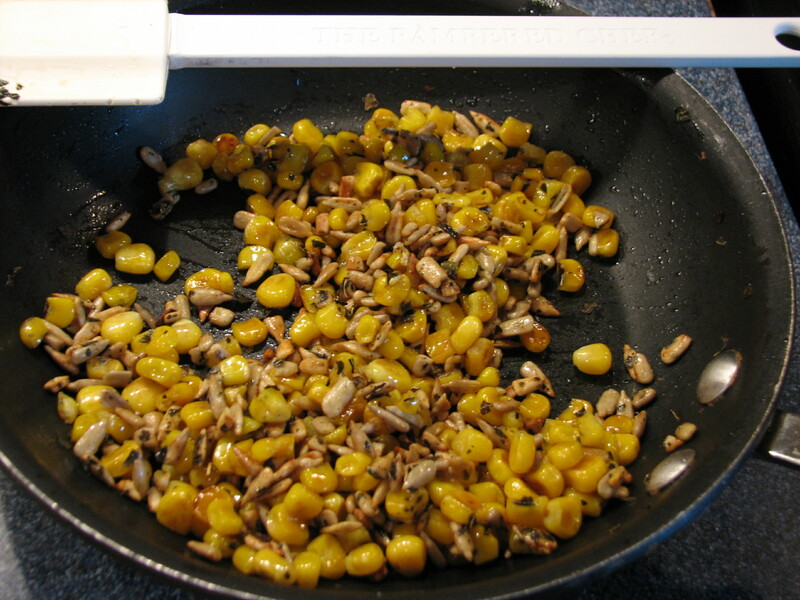 Sauté for about 5 to 10 minutes until the corn and sunflower seeds are brown like – somewhat like the color of toast. Remove from the heat and put in a glass bowl. Cool. In the same sauté pan, which should already have a coating of oil from the corn and sunflower seeds, if not add about ½ tablespoon more of olive oil to the pan. Add the zucchini, salt and pepper, lightly sauté for about 2 to 3 minutes. 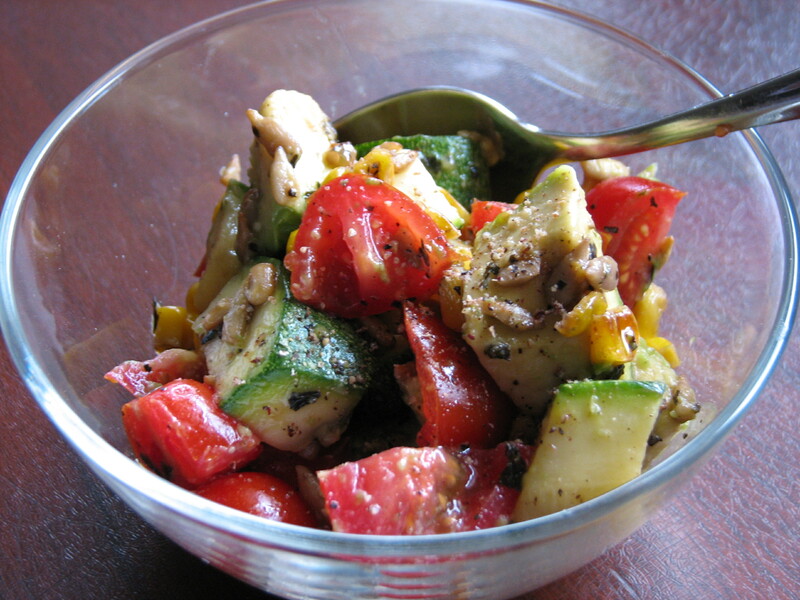 The zucchini should have a good solid crunch but the raw taste should not be there. 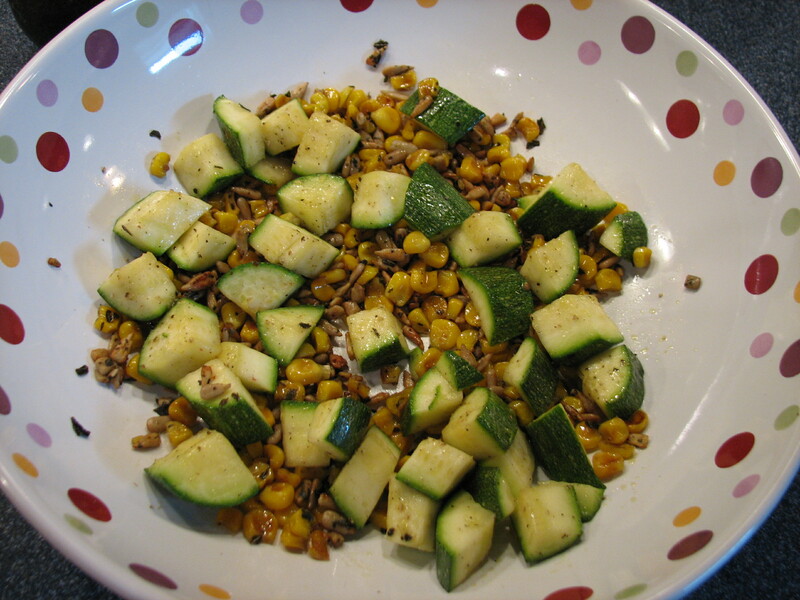 Add the zucchini to the bowl of corn and sunflower seeds. Cool. Cut up the tomatoes, put in a small glass bowl and season with salt and pepper with a drizzle of oil. Set aside. The salt will help the tomatoes create some juice. After the sautéed vegetables are semi-cool, add the tomatoes with the juice and cubed avocado to the bowl and toss lightly. Drizzle with ½ tablespoon of oil and season with salt and pepper. Toss well. Serve with whole grain crusty bread. Sometimes there are traditions that we become die-hard fans and follow so faithfully year after year. Mine is black-eyed peas (for luck) and rice, a green salad or “green” something for money, and of course the latest we have adopted is no laundry on New Year’s Day because it is bad luck. My year 2011 was an interesting and unexpected year with a huge loss and some life and career changes. I said I would not mention any resolutions for 2012 but I have that hopeful seed of anticipation. Hope you enjoy this salad as much as I do. Happy New Year! Prep all the ingredients for the salad, wash the lettuce and chop into bite size pieces. Slice granny smith apple into matchstick pieces and put into a bowl with cold water to prevent browning. Cut avocado in half and remove the seed. Then slice and cube the avocado. Cut cucumber in half and then remove the seeds with a spoon, then dice. Mince fresh parsley and green onion using white and green parts of the onion. Chop into bite size pieces 2 stalks of celery. Put all the ingredients in a glass bowl and add the apples after draining and pat dry. Mix with a wire whisk the ingredients for the vinaigrette in a small glass bowl well until foamy. Add the vinaigrette to the prepped salad ingredients and toss well. Serve with whole grain bread. 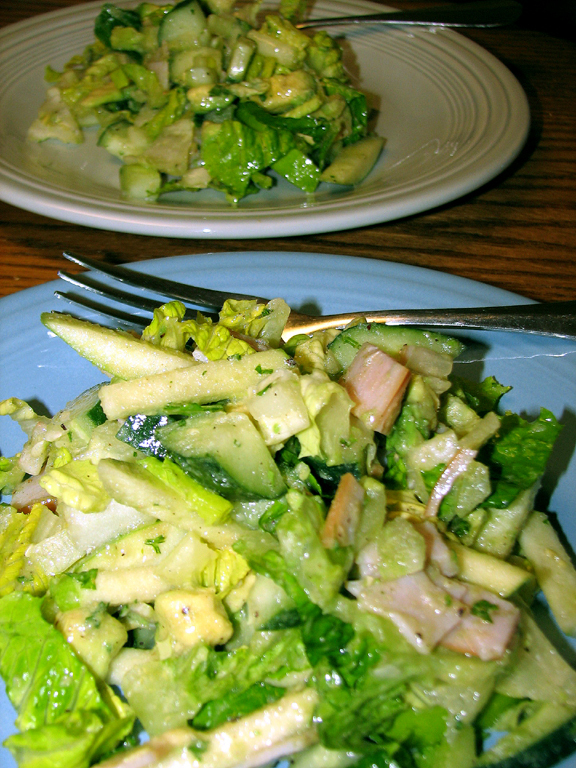 Another time when I made this salad, I added toasted coarsely chopped Almonds. This gave the salad a different texture and flavor. Spinach Eggs Benedict what can I say. Sometimes I want to be bad and have something that is sinfully rich. I never made Hollandaise sauce before so this was a new experience for me. I do not know what I was so afraid of before but after making the sauce, it was a huge WOW! factor for me. The homemade version is just exquisite. I saw this recipe on one of the food blogs I follow called Simply Recipes and modified the recipe to have some healthier ingredients such as spinach, tomatoes, and avocado. I used Canadian bacon instead of bacon or ham for a lower fat version of the dish and only used 1 tablespoon of the sauce instead of dousing the whole dish with it. Enjoy! The hollandaise sauce: separate the egg white from the yolk and reserve egg white if preferred for an omelet for a later time. Put egg yolks in a blender with lemon juice and salt. Blend for 30 seconds or until the yolks become a light yellow color and add the hot melted butter to the egg mixture and blend until combined. Pour sauce into a bowl and set aside. Fill a 10” non-stick frying pan with water about ¾’s full. Add 1 tablespoon of vinegar to the water mixture. While the water is heating up in one frying pan, in another frying pan, cook the Canadian bacon till crispy around the edges in another frying pan with about 1 teaspoon of olive oil or butter and remove when edges are crispy. Set aside. In the simmering hot water, crack an egg in a small bowl, and then use the bowl to transfer the egg to the simmering water. It is easier to use the bowl, so you do not burn your fingers while adding the egg to the water. Put all eight eggs in the water and simmer for approximately 4 minutes. Clean grape tomatoes and halve. 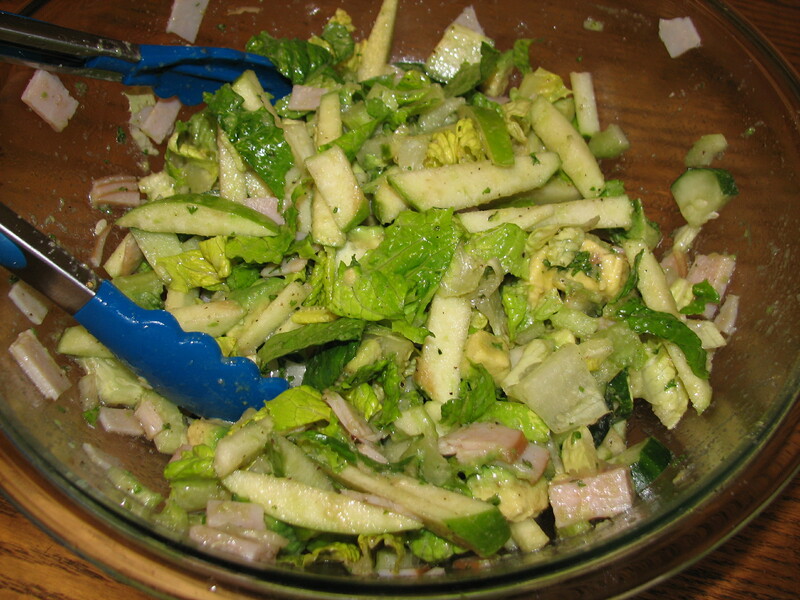 Remove the seed from the avocado and cut up avocado in cubes and spoon out of the skin. 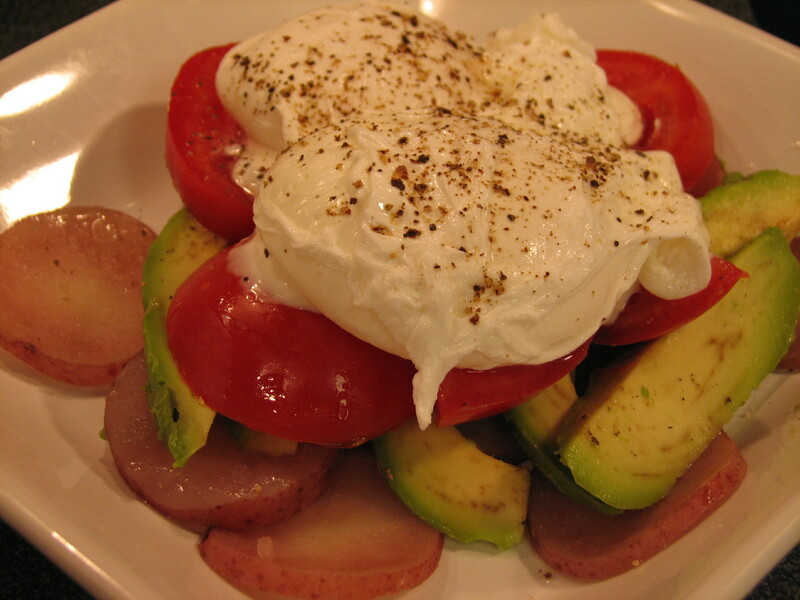 Put halved tomatoes and cubed avocado into a bowl. Squeeze fresh lemon juice approximately 1 to 2 tablespoons over the mixture. Add freshly chopped basil and olive oil. Toss well. 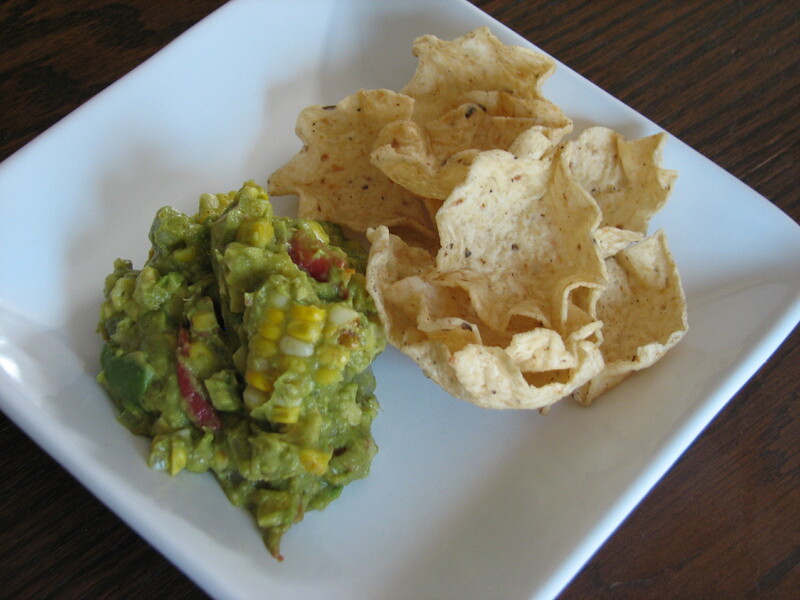 Season the tomato and avocado salsa with salt and pepper. While the eggs are cooking, toast the English muffins and put on plate. Take 2 English muffins, line English muffins with about 7 to 8 leaves of baby spinach each halve. Lay the cooked Canadian bacon on top, spoon the drained poached egg on top of the Canadian bacon. 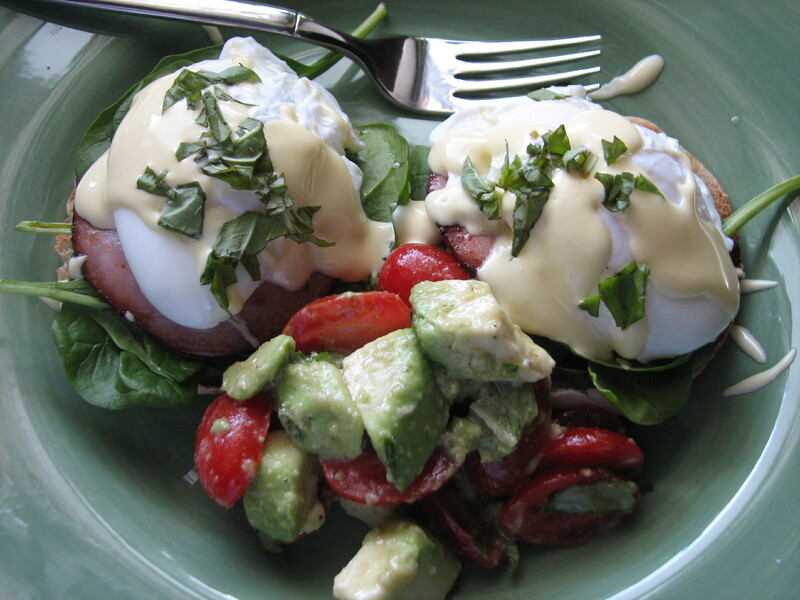 Drizzle with hollandaise sauce and sprinkle with fresh basil on top.